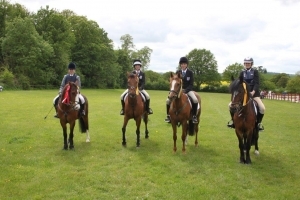 Our school equestrian team had a weekend full of success on Saturday 1 June and Sunday 2 June at Netley Hall Equestrian Centre. The show jumping team, Charlotte Davies, Megan Watson, Ffion Coates and Tegan Jones came third in the team challenge after a tight battle for the top three places. Charlotte came a fantastic First in the show jumping individual round and Ffion came Third in the dressage individual round. Well done to them all and, of course, the horses Ace, Jess, Connie and Barney.